Within months of his death, the Connecticut State Legislature approved House Joint Resolution No. 439 commissioning a memorial to General Joseph R. Hawley to be erected on the grounds of the capitol. They allocated $1,500 for costs associated with its construction, (an amount of more than $29,000 in today’s currency) and secured American sculptor Herbert Samuel Adams of New York to design the medallion. 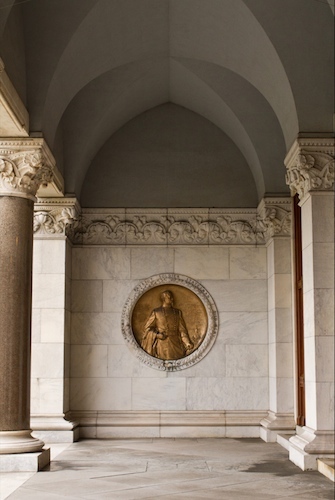 Made of bronze, it is six-feet in diameter and set into the east end of the north porch of the Connecticut State Capitol building. Centered in the medallion is a profiled Hawley, in his military attire looking strong and confident. 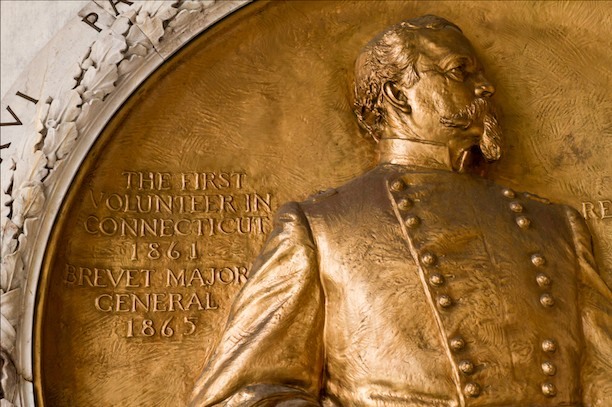 The inscription states in simple terms the ideals valued and demonstrated by Hawley throughout his life: “Patriot, Soldier, Statesman.” When the sun sets in the West over the Connecticut State Capitol, a bright beam of light reflects briefly from the memorial medallion, calling to mind the contributions Hawley made to our way of life in Connecticut and the United States. Although not a native of Connecticut, one would be hard pressed to find a man more committed to the people of Connecticut than Joseph Roswell Hawley. Born October 31, 1826, in Stewartsville, North Carolina, to a family of modest means, Hawley was 11 when his family moved north to Connecticut. His father, Francis, was an abolitionist at heart and relocated the family to a place where his beliefs were more accepted. Joseph was greatly influenced by his father and he quickly developed an interest in public service. After attending law school at Hamilton College in New York, Hawley began a law practice in Hartford in 1850. Gifted as a writer and public speaker, Hawley worked at, and eventually owned, the Hartford Evening Press. It was while working at the paper that Hawley got word of Lincoln’s call to serve in the Union army at the onset of the Civil War. It has been reported that in April 1861, just days after the attack on Fort Sumter, Hawley stated to the workers at the Press, “boys, I am going to do the fighting for this office; you will have to run the paper.” That decision earned Hawley the distinction of being the first volunteer from Connecticut to enlist in the Union army. One of the oldest men to enlist (at the age of 34), Hawley attained the rank of Brigadier General of the 1st Connecticut Infantry and fought in 13 battles during the Civil War. He was known as “Fighting Joe” for his ability to lead without fear and establish in his troops patriotism and pride as they served to protect the Union. He was intolerant of deserters and is said to have participated in the court-martials of men not willing to carry out the duties of a Union soldier. Upon returning from the war, Hawley was elected the 42nd Governor of Connecticut (in 1866) by a narrow margin. During an understated inauguration, Hawley saw the opportunity to express his beliefs as an abolitionist by stating in his speech, “the war having been a success, we must affirm that it effected the destruction of slavery in fact as well as in name…for the rights of all loyal citizens, without distinction of race or color. These things were fairly won.” Recognizing the power of elected office, Hawley sought and won a seat in Congress, first as a representative and later as a senator, serving the state of Connecticut. In Washington, DC, as in his home state, Hawley was recognized as a man of incredible standards with the ability to speak forcefully, and eloquently, to a national audience. Hawley became a sought-after speaker, addressing crowds at numerous dedications and celebrations of America’s past. 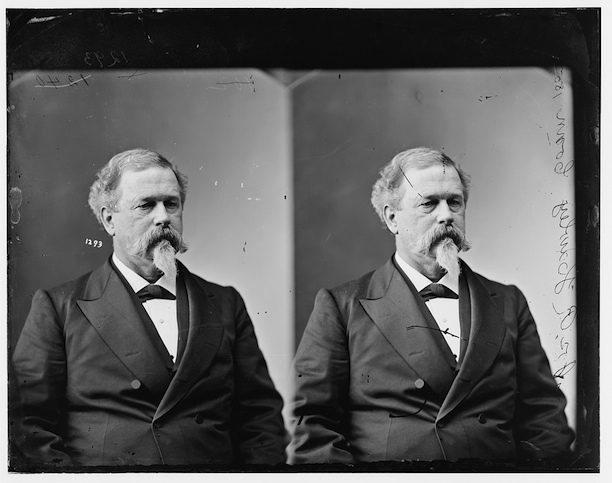 He served as Chief Marshall for “Battle Flag Day” in Hartford in 1879 and was appointed by Congress as President of the United States Centennial Commission. Known and admired as a statesman, Hawley enjoyed his standing in the community and he never wavered in his beliefs regarding civil rights. Through example he demonstrated how each citizen had a responsibility to further the greater good of the nation he fought for, governed, and loved. Evelyn Hudyma is currently pursuing a master’s in history from Central Connecticut State University. Dedication of the Memorials to Orville Hitchcock Platt and Joseph Roswell Hawley at the State Capitol, Hartford Connecticut, October Eighteenth Nineteen Hundred and Twelve. Hartford, CT: Case, Lockwood & Brainard Co., 1912. Joint Report of the Commissions on Memorials to Senators Orville Hitchcock Platt and Joseph Roswell Hawley to the General Assembly of the State of Connecticut, 1915. Hartford, CT: Case, Lockwood & Brainard Co., 1915. Link.